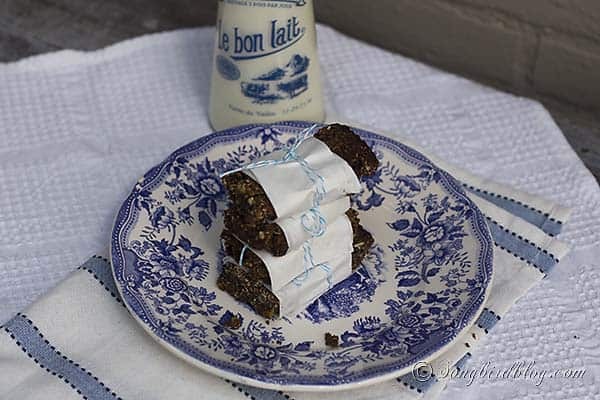 It is ‘get in the kitchen’ time… Today I want to share my most favorite recipe of the moment: very yummy – I can taste the love – pretty healthy, seed bars. These are grain-free, gluten-free, paleo and all that, but most of all I love them because they taste so good. I eat one of these on many mornings when I know I need to grab some breakfast, but don’t have the time or the stomach for a full meal. One of these with a latte will go down so easily and yet it gives me energy for hours. I’ll grab one for my mid-morning snack with a cup of tea, when I know that I am not going to make it to lunch. They are a favorite indulgence when that mid-afternoon craving for chocolate hits me. And I must say they go well with my evening cup of tea too. I am trying to seriously cut back on eating grains. I simply can feel that my body fairs better when I do not eat the wheat stuff. When I was looking for alternatives things to eat I found recipes for seed and nut bars. And then I tinkered and tested until I came up with a variation of my own that never fails me. I have to bake at least one batch of these a week, as I go through them so quickly. There is also no processed sugar in these, nor any other ingredients that start with in E. That makes them healthy in my book. The sweetness in these comes from apple butter, or stroop as we like to call it. Stroop is a regional product from around here that is making its way around the world. It is made from cooking apples (and nothing else) until they are a dark, gooey mess that is sweet but also a bit tart. We eat it on bread, and I used to devour it on dark rye bread with cheese. Speaking of cheese, it is amazing as a side on a cheese dish. And it usually goes into our beef stews too. Oh and we spread it over pancakes. But it also does well as a sweetener in baking too, as I am finding out. Go hunt down the good kind, that does not have any added sugars in it. It is so good. I vary up the ingredients depending on what I have on hand but the variation I show today has become my favorite. It contains at least four different seeds, that give it a nice crunch. 90% pure dark chocolate (lots of anti-oxidants) and dried apricots (for some extra chewy goodness). And it is an easy and quick recipe. So let’s get on with the construction details shall we. Combine until all ingredients are thoroughly mixed and there are no dry ingredients anymore (it will be a rather loose crumby mess now). Stir in the chocolate chips and the apricot pieces. Mix well. Put in a greased baking dish and with the back of a wet spoon pat it well until flat and there are no air pockets anymore. Spinkle some coconut flakes on top. Bake in oven at 325F (170C) for 25 minutes. I grind my own sunflower flour in my mom’s old coffee grinder, I find it cheap and easy. But you could also use other seeds or even almond flour. For the mini seeds I usually use any or all of these: chia seeds,ground flax seeds, poppy seeds, sesame seeds. Depending on the sugar content of your apple butter, I would possible leave the maple syrup out. Since my apple butter is the original dark no-sugar kind I sweeten things up with a bit of syrup. As a variation on the apricot, you could use raisins, dried cranberries, dried cherries etc. I have tried them all, and they are good, but I just love the apricot/chocolate combo. This is a crumbly bar. To make sure it doesn’t crumble too bad make sure that you press it in the baking dish real good and that it is utterly cooled before cutting it. Good morning! Top of the morning to you Songbird!!! It comes from a singer /Christian rapper Toby Mac in a song by Mandisa another Christian singer. It’s a very peppy song that ill have to play now that I’ve written it to you!!! It’s on You Tube one of her older songs. But I digress. Now how you wrapped, tied with that cute blue and white string, have the bottle of milk and the pretty Dutch plate…it brings back memories when my sister was collecting things like this from Holland. A shop sold new items and it was fun to shop and look. So it swung me back to a sweet time. These do look delicious. I would like them at the worst time of day…oh about nine o’clock!! At night!! I’m saving them for many friends also don’t eat wheat. Is it this new wheat getting more heads of grain per acre?? For thee wheat of the ’60s did not make kids or adults sick and we ate white bread!!! Have a wonderful day. Thank you for a new recipe that sounds good. I have apples. Hmmm…could I dare make my own strop?!! Ok, these sound really, really good, but is there something I can use to replace the apple butter? OR do you have a recipie to make it? I know this won’t be in any store. I’ve made apple butter in the crock pot before, but its more like a really concentrated apple sauce……any helpful hints would be muchly appreciated. Hmm a recipe to make apple butter? Can’t say that I have one, but I think it is a matter of simmering apple juice on a stove for days while frequently stirring. I think you could try making the bars with honey. Leave out the syrup then since honey is way more sweet than apple butter, and they will be more sticky. I haven’t tried it, but I think it might work. The apple butter gives these a sweet taste and it is the glue that holds everything together. Good luck! Hope you’ll find something you can use. Beware, applebutter is not the same as appelstroop since this contains sugarbeetjuice i.e the same thing as sugar. To make your own boil verry little water with about two pounds of overripe apples to mush. Then use a fine sieve or collander and cover with a cheescloth to strain your sauce and catch the concentrate in a rvs pan (highpressurepan works great) then heat to a thick syruplikeconsistency, the longer you heat it, the thicker it gets, but wil continue to thicken while cooling down.